I know, I’ve been pushing this drone theme a lot lately (here and here and here). Maybe I should move on. But really. We have a president who insists it’s okay to shoot missiles at people in countries we’re not at war with just because they’re hanging out in the wrong places. It’s even okay to shoot missiles at people in countries we’re not at war with who are US teenagers with no known history of doing anything wrong. That seems worth calling attention to again and again and again. Mind you, our use of drones in Pakistan and Yemen is still a government secret, even as Obama administration officials talk about it when doing so suits their purpose of projecting an image of resolve and success in the war against al-Qaeda. I wish we could all live in a world where we could hold hands and love each other. The fact is, that’s not reality. We have an enemy that wants to kill us. I live in New York. I lost over 150 constituents on 9/11, and if we can save the next 150 by killing al Qaeda terrorists with drones then kill them. We have to assume that there’s always going to be an increase in weapons. This has been the history of mankind. That’s why we have to make sure our defense budget is not weakened and that we stay ahead of the enemy. There’s evil people in the world. Drones aren’t evil, people are evil. We are a force of good and we are using those drones to carry out the policy of righteousness and goodness. What has it come to when one of the most extreme right-wing, Muslim-hating members of Congress so strongly supports Obama’s undeclared drone war? What would King — an ardent supporter of the IRA — have said if the UK used drones a few years back in Belfast neighborhoods where IRA provisionals were known to congregate? There’s something to be said for democratic processes and the constitution. I prefer the rule of law to a president empowered, in the name of righteousness and goodness, to judge who’s naughty and who’s nice. 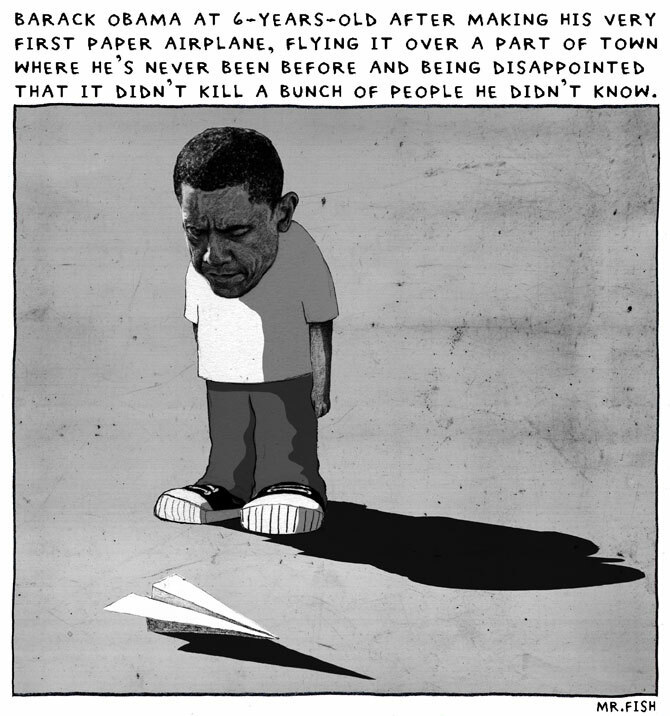 I doubt Obama knows how to make a paper airplane.